I cooked a couple of good dinners this weekend. Saturday’s dinner was good, but not everything I did worked out well – I’d made a crockpot roast chicken with vegetables, and while the chicken was really nice, I’d used the vegetables to keep the chicken off the bottom of the crockpot (instead of balls of crumpled aluminum foil), and the vegetables ended up cooked in the juices, and I prefer the taste and texture of roasted vegetables. The other thing that didn’t work out well was the gravy – I’d rubbed the chicken with a mix that included paprika and cayenne pepper, and the gravy was spicy, which was not what I was expecting. Overall, though, the meal was quite good. It was totally outdone by tonight’s dinner, though. I had a roughly six-pound pork shoulder roast, which I slow-roasted after applying Long’s Peak Pork Chop Spice, crushed garlic, and olive oil. Marion was very impressed by dinner. 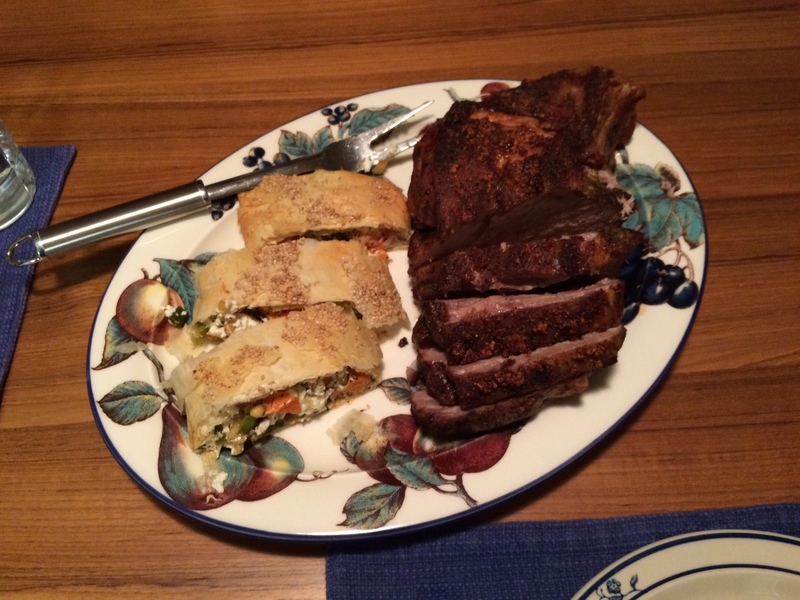 The meat was falling-apart-tender, and the strudel was incredible. That’s another recipe that goes on the “keeper” list. We’re looking forward to tomorrow night’s leftovers. This entry was posted on Sunday, January 11th, 2015 at 11:24 pm and is filed under Food and Drink. You can follow any responses to this entry through the RSS 2.0 feed. Both comments and pings are currently closed.